Cherries are one of the best fruits of early and late summer. Packed with antioxidants and sweet natural sugars to the pit, these juicy treats are perfect when paired with coffee’s rich flavor. The recipe today is a great complement to cherry’s divine flavor. 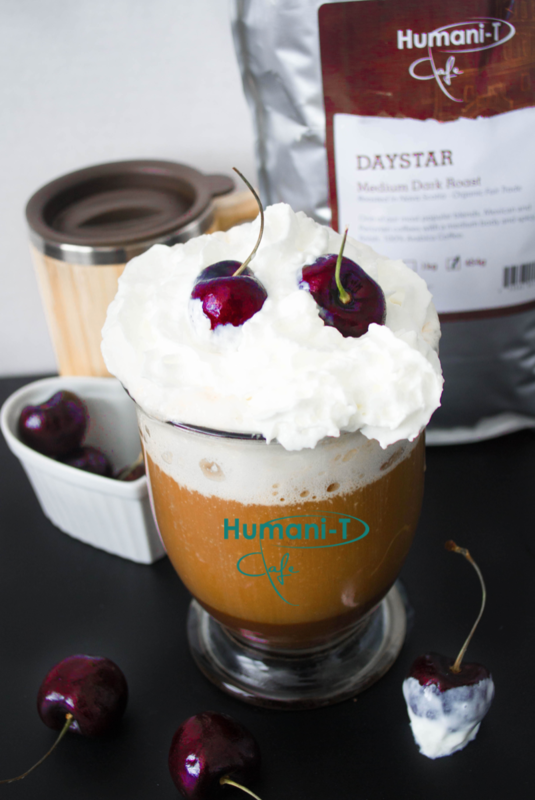 It’s the perfect beverage/dessert to tickle your fancy with whipped cream and a cherry on top. Brew your Humani-T Organic Fair Trade ground coffee. Meanwhile reserve a large mug, along with whipping cream, chocolate sauce, and cherries to the side. Now, add sugar, cocoa powder, almond extract, and cherry extract, to a small container. Mix well. To bring this all together, add some chocolate sauce to the bottom of the mug. When coffee is ready, pour it over the top. Add the mixed container of ingredients in, and stir well. Finally, add whipping cream or heavy cream, garnish with cherries, and serve.